I ran a second NPS survey on the business analyst community over this last summer. I didn't get nearly as many responses as the last time. (Here is the results of the last survey.) Below is the analysis from this survey. Why do a survey on the BA profession? For me it's a hangover from earlier work with Business Analysts, as well as a general interest in whether the 'BA profession' is changing now that the IIBA is operating to bring people together under a bunch of standards. Is the BA profession getting more valuable with it's certifications, training and industry standards? Does the introduction of an industry body and standards make a difference to the quality of work people do? Apart from Demographic question the survey was very straightforward. On a scale of 1-10 how valuable is the contribution of the BA you work with? The survey doesn't target business analysts as the respondents. It targets the people that work with business analysts. The survey went out to people via Linkedin and Twitter and ran from December 16 to Feb 17. There are some natural biases in the participant self selection process, but I won't dwell on them here. 21 is still a response though and gives some insight. Almost all the results this time came in from Oceania (Mostly Australia) with just a handful from North America, two from Europe and one from Asia. The American, Europe and Asian results all called out their experience with business analysis as highly positive with advocate level scores. 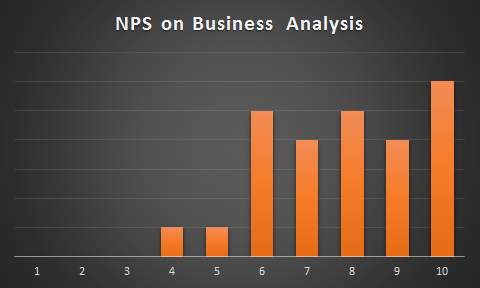 The NPS scores are represented in the chart above. You can see only one response giving a score of 4 and 5. The majority of scores are between 6-10. In NPS parlance however 6-8 is not good scores. Up to 6 is a negative score. 7-8 are neutral. After all the instrument is measuring how likely people will advocate for your service, not just whether they are satisfied. The first result to note from the results is that the NPS was three. This is up from -six last time I ran it. Don't get excited though the difference in scores could just be the different people that responded. If we filter out the non-Australian results we see that the Australian industry generally finds Business Analysts more trouble than they are worth, potentially contributing only administrative and commodity level contributions. There might be something there though. Things might be getting better. When you read the scores there is less frustration with an overly dogmatic pursuit of process standards and templates. See more below. Additionally there wasn't much chatter about process over content. It looks like that part of the discussion is outside my network or else a mostly solved problem. There was a clear sense that 'agile' teams are happier with the contribution of business analysts than non-agile teams. It also looks to me that people are doing other roles (eg agile coaching and scrum mastering) on top of the BA work and that the work that lives in those job descriptions is what is being valued. Perhaps what the BA is doing is leveraging their process knowledge and facilitation skills and aiming them at the delivery team rather than the customer/client. Where I saw the BA being valued there was also often mention of a Product Owner" being on the team also. There are obviously issues with the set of respondents. There are biases based upon my network, my geography and the way people select themselves into this survey. There are trends in this response set that probably aren't global, but they probably do represent an industry trend. The BA as team coach model is one I have always though wrong based on my notion of what a BA is and should be doing. Maybe that doesn't matter. If talented people can bring skills to bear in a useful way, maybe that's the important thing and job titles are irrelevant. What happens if we solve the agile bias in my network? Would you like to help me run this survey again next time? Put your name below or message me. I'll be in touch when the time comes.